The Yankees started this hot stove season with rumors flying that they would completely stay out of the bidding for any big free agents. This put them likely out of the running for guys like Nelson Cruz (Mariners), Pablo Sandoval (Red Sox), Hanley Ramirez (also Red Sox), Jon Lester, James Shields and today’s subject, former Detroit Tiger Max Scherzer. Just a few weeks later, everyone remembered they were talking about the New York freaking Yankees, and the Scherzer to the Bronx rumors began flying. In my humble opinion (or maybe not so humble), I think the Yankees need to sign Scherzer, and failing to do so would probably doom them to a third consecutive October with nothing to do but shop for Halloween costumes. Let’s break down potential target, Max Scherzer. Scherzer, a 30 year old righty from St. Louis, MO, was drafted 11th overall out of the University of Missouri Columbia by the Arizona Diamondbacks in 2008. He made his big league debut for the D-Backs in 2008, and joined their rotation full time the next season. Just two years after his debut, however, he was traded to the Tigers as part of the three-team deal that got the Yankees Curtis Granderson (that really was a pretty great trade for everyone, wasn’t it?). 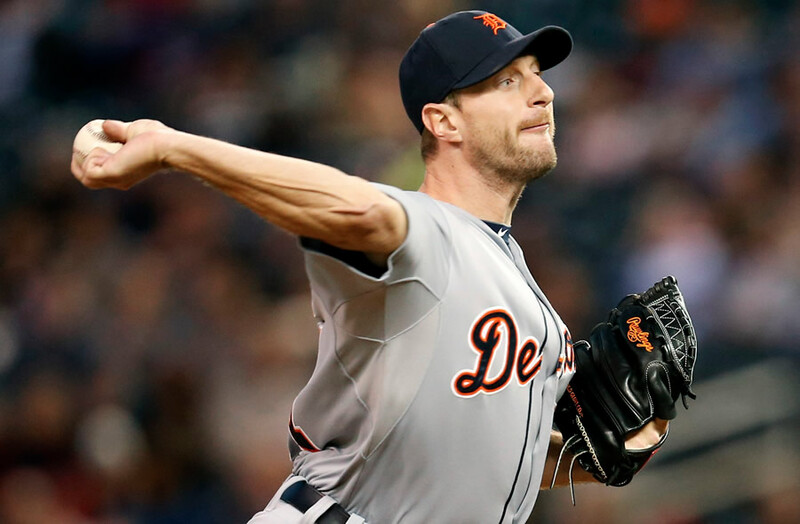 Scherzer went on to become a staple of the Tigers’ rotation, winning 82 games over the next five seasons, with a 3.52 ERA and 9.6 Ks/9 during that time. It has been over the last two years, however, that Scherzer has become a real star. During his age 28 and 29 seasons, he went 39-8 with a 3.02 ERA, a 1.074 WHIP and 10.2 Ks/9. In case you’re wondering, he’s led the league in wins the last two seasons (both All-Star years) and hasn’t had less than 231 Ks in three years now. He also won the Cy Young Award in 2013. Wowsers. In my opinion, the Yankees need to sign at least two pitchers this off-season. Right now, their rotation doesn’t really have anyone you can count on to put up a full season. Michael Pineda and Masahiro Tanaka were brilliant last year, but both are major injury risks and missed significant time in 2014. Ivan Nova won’t be back from Tommy John surgery until mid-season at the earliest. Hiroki Kuroda might be retiring. CC Sabathia, meanwhile, has knees made of wet cotton, and was pitching pretty terribly before he even got hurt last season. I love Shane Greene for what he did last year, but he’s just a kid, and you can’t assume he won’t suffer from the old Sophomore Jinx in 2015. The point I’m getting at is that they need arms. Why not sign the best one available? Sure. I hear those of you who are tired of the Yankees giving guys in their 30s tons of money and years, only to watch them break down after a couple of seasons, and that they need to focus on developing minor league talent instead. However, i’ll take four years of health and a couple of non-healthy ones if it means actually making the playoffs and possibly winning a 28th World Series. The Yankees do have some arms in the minors that could help the rotation in 2015 and beyond, like Manny Banuelos, Bryan Mitchell and Luis Severino, but, again, those aren’t bankable guys right now. They’re either too young, or not far enough along in their development to be counted on. Scherzer is one of the best pitchers in the game. He’s going to get paid like it. I’d rather see that money come from the Yankees. It’s not like the Yankees don’t have money to spend. Any financial restrictions they place on GM Brian Cashman are designed to maximize profit, rather than prevent losses. Let’s also not forget that the Red Sox and Blue Jays have significantly improved so far this off-season, and the Yankees are in danger of falling hopelessly behind. Scherzer would be a big step towards showing the rest of the division that the Yankees won’t be pushovers for the third straight season. I don’t know about you guys, but I’m tired of pretending October baseball doesn’t exist. Also, the man has two different colored eyes (that’s legit. he has heterochromia iridum), and we need that kind of gumption in this rotation! Dear Brian Cashman… get this done.